This July, the southern Indian state of Kerala was devastated by unprecedented flooding, resulting in displacement of millions of people from their homes and communities. Government and non-government organisations from India and around the world provided emergency aid and supplies. But it is well recognised that there will be long lasting social and economic consequences. To provide support to the relief efforts, Bromley Sanskaar Shakha pitched in too. On Friday 31st of August, the shakha hosted their first Sewa Walkathon, in aid of Kerala flood relief. In addition to raising funds, this was also an opportunity to promote exercise and walking, getting fit and healthy, breathing fresh air and enjoying the natural beauty and, of course, having a lot of fun! The walkathon took place in the High Elms Country Park near Orpington in Kent. Participants from 10 years to over 70 years enjoyed the brisk woodland walk, through dense trees and accompanying birdsong, under perfect weather conditions. We were delighted with the presence of a few members of Woolwich Shakha, who contributed their share as well. After walking for an hour or so, everyone enjoyed some Khel, followed by an assortment of light snacks. 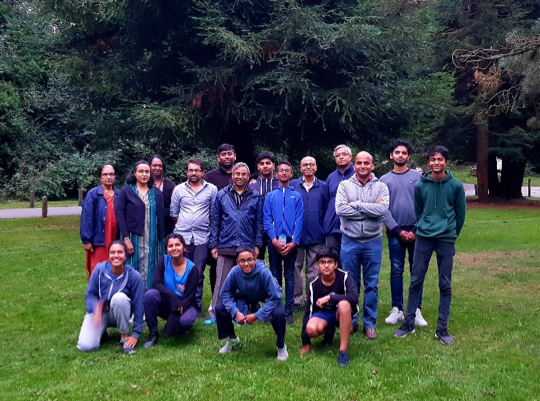 It was a great experience for all participants, and we particularly enjoyed the company of Falguniben, who was on pravaas in Bromley on the day. The event raised £150 on the evening, with further contributions following later. We hope that the money raised will help people in Kerala get food, water, and shelter.